Have you noticed Montana runners wearing Big Dipper Running uniforms and wondered what is the Big Dipper Running Team all about? August’s MTC Trail Chat is with Em Kendrick who is the Big Dipper Running Team manager. Em Kendrick has lived in Missoula with her husband, Tory, for 15 years. They have two daughters, Annika, 10, and Sylvie 7. Em works at the Runners Edge and is Assistant Cross-Country coach at Hellgate High School. Whenever I see Em, she always has a big smile on her face and her positive energy and enthusiasm is contagious. Em asked me if I wanted to join the Big Dipper Running Team early spring and I jumped at the opportunity since I love their homemade ice cream and want to support organizations that foster and promote community spirit and service. From Left to Right: Heidi Gaskill, Emily Kipp, Charlie Beaton (Big Dipper owner), Anya Gue, Em Kendrick, Anna Doran, Marlie Johnson. Can you tell the readers who founded the Big Dipper Running Team? What exactly is the mission of the Big Dipper Running Team? 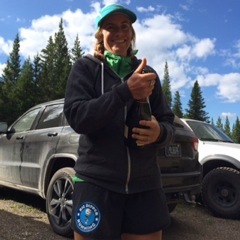 The Big Dipper Running Team's mission is to bring together competitive women trail runners and provide camaraderie, support, serious training partners and ice cream! We will train and race together as much as possible and have a positive presence in the local community and the trail running world at large. 5) Have a positive social media presence that is enthusiastic and informative. Our great sponsors include Caffe Dolce, Sapphire Physical Therapy and the Runners Edge, in addition to Big Dipper Ice Cream. I think the biggest benefit of being on the team is the training support that we can offer to each other. It is so nice to have a solid group of runners who want to do workouts, long runs and maybe offer advice and support. Our varied experience is also a huge asset; we have a PT, two PA’s, two personal trainers, and coaches. The team is really low key and mostly about the camaraderie, but we all get a racing kit, lots of ice cream and lots of laughs. How does being a member of the team benefit the sponsors? Sponsors get positive press and involvement in a fun, active community. The Team sponsors share a vision of healthy lifestyles, hard work and fun competition. There are plans in the works to create more events and build upon the buzz that is the Missoula trail running scene. What is the long range vision that you have for the Big Dipper Racing Team in the next five years? We hope to increase the exposure of trail running around Montana and beyond. Team members all have specific goals that they are working to achieve and the Team is very supportive of them. Being positive role models and ambassadors for the sport is at the core of Big Dipper Running. The possibilities in the future are as limitless as the number of possible Big Dipper Ice Cream flavors. Is there a Facebook Page or other social media site to follow the team? We sure appreciate all the work you do to organize and guide the Big Dipper Running Team. 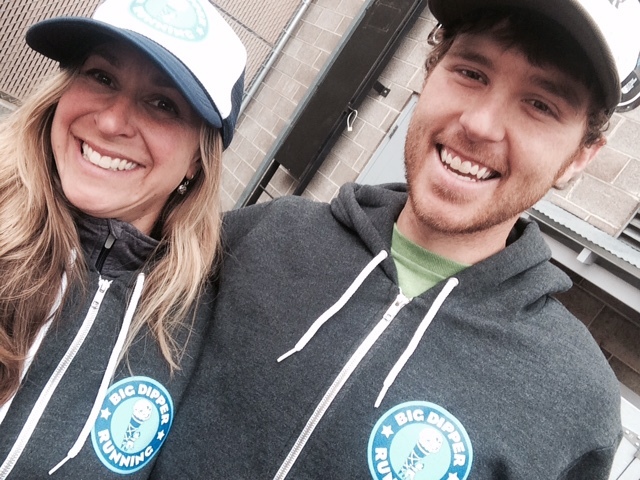 People like you and Charlie (owner of Big Dipper Ice Cream) and all the other Big Dipper Running Team sponsors are making Montana a better place for runners. A big thank you to you all!